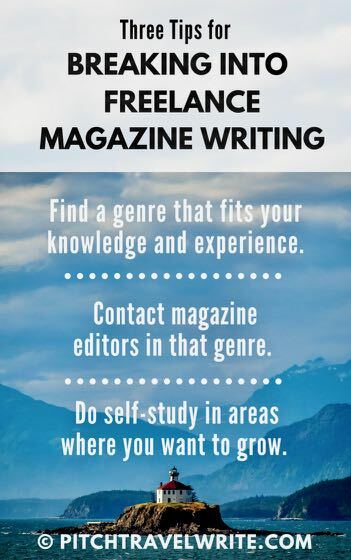 Breaking into freelance magazine writing is something many people aspire to do but never quite figure out. Here’s how Chuck Warren used his knowledge and experience in the boating industry and made it look easy. It’s an inspirational read for anyone thinking about entering the competitive field of freelance magazine writing. I've been writing since I was 12 but never really did anything with it. I wrote some poetry, love letters, and edited stuff for other people but threw most of what I wrote away. After I met my wife in 2000, she made me stop tossing my work in the trash. But, I still never did anything but talk about become a writer for the next 15 years. On January 1st of 2016, at 53 years old, I decided it was time to put up or shut up. My New Year’s Resolution was to be published by the end of the year. I had never submitted a single article or even written one intended for publication. However, after reading different things from Roy Stevenson and a few other writing "gurus" I decided to try and make that happen. I've been through three back surgeries and wanted to see if I could create a new career that I could do even if I was ever knocked permanently off my feet. After the last surgery failed to relieve any of my ongoing issues, I decided I needed a safety net. What better to choose as a target than my personal dream? I have a great deal of boating experience, professional and recreationally. When I set out to get my first article published in 2016 I used that as a springboard. I’m a licensed Captain with 30 years as a marine industry professional and have been everything from the Captain of a sunset cruise in the Florida Keys to the driver of an offshore powerboat racing team in New Jersey. I’m regularly hired to operate other people's vessels when they don't want to, and I offer charter cruises on my own 40-footer. I spend a great deal of time on the water and at the helm. I reached out to Lakeland Boating, a well-circulated midwestern regional magazine, and asked for their guidelines. The Lakeland Boating editor answered, asking me for a writing sample. I had nothing to send her so I sat in a coffee shop and threw something together, then sent it the following day. She replied with an invitation to be the magazine's representative at a press event that was close to my home. The assignment would be to review a brand new $2.2-million-dollar yacht for an upcoming issue. I was shocked, and terrified. But of course, I couldn't say no. I still believe the editor had no idea of my inexperience. I accepted the assignment, spent the day with the yacht manufacturer, then wrote and submitted the article. When I asked the editor for any required changes, I was blown away by her reply; the piece was going into the publication as it was - she hadn't change a word! My luxury yacht feature was the cover story of that issue of Lakeland—all by August of 2016. I had no experience and no idea what to do, and my first attempt at becoming published landed the cover story in a magazine I read regularly! It was a surreal experience. Even more amazing, the magazine gave me another assignment three weeks later. I sent in the draft of the second article and was again told it was running as is. Then, I wrote an article about transplanting from the Atlantic Ocean to the Great Lakes and blindly sent it in to Michigan Blue magazine. It was also accepted for publication. Blue followed up with another assignment, and both magazines continue to give me assignments. I’ve just received proofs of my two latest features for Lakeland Boating. I’m also waiting for my article on the Chris Craft Yachts founder's grandson to hit the shelves, which will be in the next issue of Blue. And, right now I'm working on a new piece for Blue about tall ships around Michigan. You can find full issues of the print magazine on Lakeland Boating and links to every one of my published articles on Lakeland's site. You can also see my article on Great Lakes Boating's website. Since August, 2016 I've been writing regularly for Lakeland Boating magazine, which covers big and small water toys on the Great Lakes, and Michigan Blue magazine, which is a very nicely put together Michigan Lifestyle publication covering everything from local history to the best area eateries and must-see destinations around the state. I’ve had 8 magazine cover stories, have had two articles in a single issue, and have had my work in two magazines on the shelf at the same time month after month. I’m on my 13th article for Lakeland and my 8th for Blue. I’ve also written for Great Lakes Boating magazine and will be contributing more there as well. I’ve also had other pieces accepted for publication, such as a story on a local craft brewery by a new magazine called Links and Libations. I can now walk into any store that sells magazines and pick up a publication with my article and photo in it. That’s an incredible feeling! Last year a design company approached me to create content for their client's websites, as well as blog posts, educational articles, and other content. They found me by stumbling onto my website and contacted me based only on what was written on my home page. I still find that absolutely amazing! My freelance magazine writing journey over the past two and a half years has been nothing short of incredible and I'm trying very hard to continue moving forward. It still feels like a dream at times. I can't believe someone values what I have to say enough to let it represent their publication to their subscribers. And, they keep asking for more! I recently realized that I've been creating what might as well be travel pieces for one of my regular blogs. 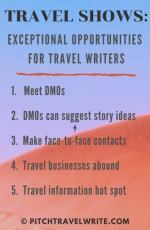 I'm hoping to use that to gain traction in the travel writing space but I know I need to focus on the whole travel writing picture. I especially need help with the query process since I’ve actually had more than 20 articles published in the last two years but have never sent a single query letter. This is a good thing and a bad thing; bad because I still haven't had any reason to grasp the query letter concept. That is my focus for 2018. I know I need to better understand that process if I'm going to play in the big leagues. I want to travel more and slowly turn writing into my full-time career, so it's time to step up, time to learn. My first order of business will be to re-read Roy’s book on query letters. After that, he’s given me the confidence to put that knowledge to good use, so it's time to break out the tools and get to work. 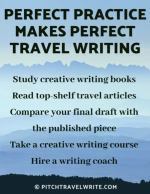 I’ve used quite a few resources from the PitchTravelWrite website to help me break into freelance magazine writing. 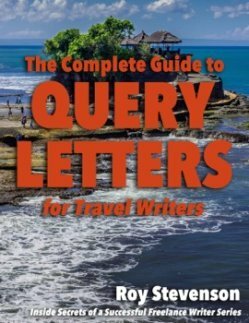 I’ve read some of Roy’s books and most recently I read the Kindle version of The Complete Guide to Query Letters. On the way home to Michigan from Cabo San Lucas I searched for some info on query letters and found his book. Thankfully, it was the last thing I was able to download before needing to hit the Airplane Mode button. All Roy’s information has been helpful. Anything I've read from him has given me another piece of the freelance magazine writing puzzle. Travel is my focus for 2018 and although I know I'm overlapping slightly into travel now, I have a lot to learn. My goal for this year is to have a published piece in a travel-focused magazine by December 31st 2018. But, the most important piece Roy has contributed to my personal writing puzzle has been self-confidence. Roy’s emails, books and newsletters come across like he’s just a regular guy. He’s like a friend who happens to have figured out how to get published and is willing to share that info - not one of the most successful travel writers on the planet. What Roy has done for me (and countless others I'm sure) is make me believe that, if he can do it, I can do it too. His information is helpful and educational. It's also easy to read and digest. It’s simple, direct and completely devoid of pretension or self-importance. Someone with Roy’s track record could brag about his success and I'd still read his books. But he doesn’t do that. He just does his best to help the rest of us grow as writers. He makes us all feel like we can achieve the same success if we put in the time and effort. That is invaluable. Yes, the education is worth every dollar I've paid for his books and e-books. But the genuine, believable "Yes you can" message is worth so much more. My thanks again to Roy. He is truly an inspiration and he sets the bar we all aim to reach. I really appreciate the information he so willingly shares with all of us, and the confidence he generates, which makes it seem possible. Chuck’s had many impressive freelance magazine writing achievements since he kicked off in January 2016. He’s progressing from strength to strength, and gaining more confidence with every published article. Chuck has taken several key steps to boost his burgeoning freelance magazine writing career. 1. He contacted editors. He’s put himself out there! He overcame his beginner’s fear of having no bylines to his name and contacted an editor. This simple step is one that every writer has to take if they want to get published, and it has obviously paid off for Chuck - big time! 2. 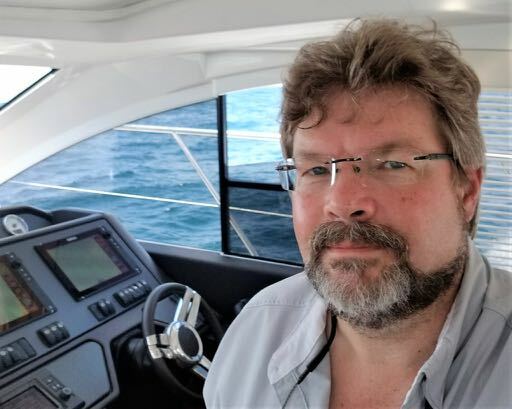 He used his knowledge, experience, and interests for all forms of sailing and boating to break into the freelance writing field. This is probably the easiest way to start your freelance writing career because you’re writing from an expert point of view. You know the topic inside out. For years, I’ve been recommending that you break into freelance magazine writing by focusing on your experience and topics that you love. I broke into freelance writing by writing about running (my passion), health & fitness (my primary career for twenty years), and military museums (another passion). Now that Chuck has gained confidence by accumulating some bylines in topics where his expertise lies, he’s starting to branch out into other fields that interest him, including travel. 3. Chuck is doing some self-study to support his travel writing goals. He’s smart enough to avidly study the art & craft of travel writing and how to write a successful query letter. This self-study will save him much time over trial and error. 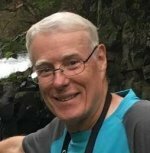 While experimenting with writing through trial-and-error provides indelible lessons, Chuck’s learning curve will be greatly enhanced by reading expert’s advice, especially now that he’s got some experience behind him. My thanks to Chuck for sharing his story. What he’s accomplished with freelance magazine writing is inspirational and impressive. We look forward to hearing what his venture into travel writing brings him next.